The Titan Brute is a steel trench box that has a tough and durable design. 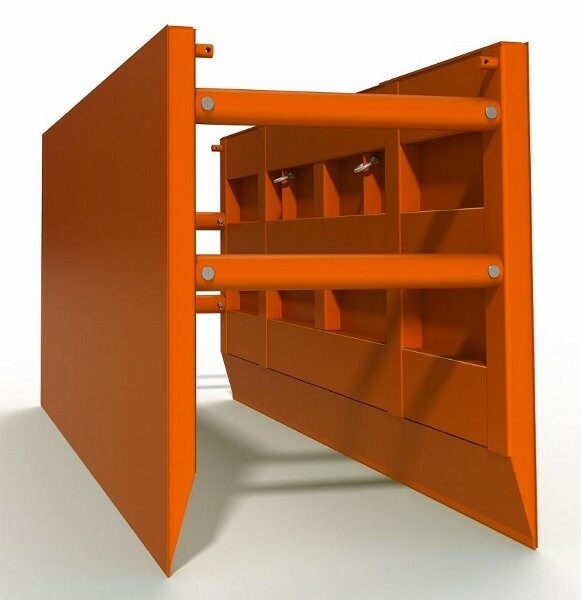 The all-steel, solid-welded and double wall design of these trench box was made for heavy-duty trench safety work. These shields rely on thick, reinforced formed steel for unwavering toughness in the trench. They were engineered for durability and deep depths. Each Titan Brute trench box is crafted with high taper reinforced knife edges. These edges increase the pipe area by allowing a tighter trench. Spreaders are located on the very outside edge for maximum inside clearance. The Titan Brute trench box is available in widths from 4 feet to 10 feet with varying sizes for the wall heights. What makes Kundel Titan Brute Series of Trench Boxes better than the competition? The Titan Brute Trench Box features continuous welds as opposed to the competitions stitch welding. Each trench box is built with internal shelving which is a feature unique to Kundel. These trench boxes are not filled with wood and foam that can rot and retain water. They also place thick steel pounding pads directly on top of continuous steel vertical end tubes. There is no wood filler at the top. When you tamp the box into the ground the force is transferred straight to the bottom cutting edge. The Kundel Titan Brute Trench Boxes are designed to rack as you pound one side at a time. Each corner moves independently, allowing for more efficient installation and removal.